Custom logo flip flops are an excellent and truly unique way to increase brand awareness. We imprint your brand logo into the bottom of the soles so that each step down the beach leaves imprints of your logo for everyone to see. This kind of endless advertising can create an incredible return on your investment. We create free digital design proofs by request. Contact us today for a free proof showing how your custom logo flip flops will look! Our primary focus is on creating high quality custom logo flip flops that will last for years, not flimsy flip flops that get thrown away within a week. The better the quality, the more imprints the flip flops can make. This premium quality is what sets FlipSidez apart from the competition. With a 15mm thick sole that consists of 3 layers of high density Rubber and EVA foam, our Classic style flip flop is similar to Havaianas. The top sole layer is soft and comfortable against your foot, while the outsole is extremely tough and durable. The satin smooth straps are made from Eco friendly PVC. FlipSidez can match or beat the price of low quality imported logo flip flops at all quantities. We have the fastest turnaround time and the lowest MOQ in the industry, requiring an MOQ of just 10 pairs for flip flops with a custom logo design. Furthermore, if you can create a design using one of our standard fonts, there is no MOQ. 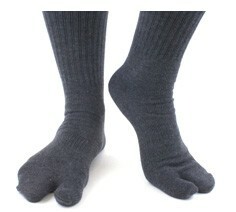 You can buy just a single pair! 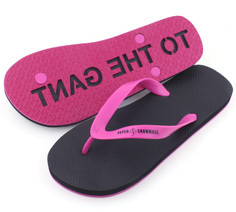 While there are many promotional product companies that import custom logo flip flops, Flipsidez is the only company that manufacturers them in the USA. With FlipSidez you are dealing directly with the manufacturer. You are welcome to come inspect your order and watch as your logo flip flops are cut, glued, pressed, and finished by American workers. Contact us today to request a free design proof and a quote.